The SFs also feature the patented* Lake And Walker Knife Safety (LAWKS®), which effectively turns the folders into fixed blades when actuated. The result is a design that gets blasé knife enthusiasts suddenly excited. 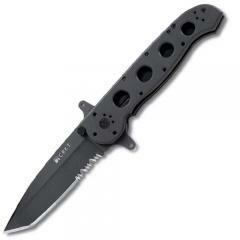 When open, with LAWKS actuated, it offers the strength, rigidity and safety of a hilted fixed blade. Release the LAWKS lever, release the locking liner, and it folds to an easily carried length. You have the advantages of a fixed blade without the disadvantage of a costly sheath carry system. Two sizes are available. Excellent knife, lives up to its reputation. Smooth action and locking mechanism is all it's cranked up to be. Great solid construction was a bit disappointed that it wasn't spring assisted but still opens just as fast.